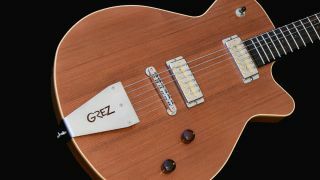 SUMMER NAMM 2017: Petaluma, California-based guitar co Grez Guitars is launching its first production model, The Mendocino. The Mendocino features a 13.25” compact size and light weight (5lbs) yet promises a full-size semi-hollowbody sound. A redwood top is paired with a Honduran mahogany body, while the mahogany neck is reinforced with carbon fibre and packs a Macassar ebony fretboard. Elsewhere, the model includes Lollar Goldfoil pickups, a Tone Pros AVR2 bridge, and that eye-catching Grez stainless steel tailpiece. No word on price yet, but The Mendocino is available from 15 September - head over to Grez Guitars for more info.